1 E None No Power Seat 1 E is a standard Business Class seat however, the proximity to the lavatory and galleys may be bothersome. 21 D None No Power Seat 21 D is a standard Economy Class seat with limited recline and the proximity to the lavatories may be bothersome. 21 E None No Power Seat 21 E is a standard Economy Class seat with limited recline and the proximity to the lavatories may be bothersome. 21 F None No Power Seat 21 F is a standard Economy Class seat with limited recline and the proximity to the lavatories may be bothersome. 22 A None No Power Seat 22 A is a standard Economy Class seat with limited recline and the proximity to the lavatories may be bothersome. 22 B None No Power Seat 22 B is a standard Economy Class seat with limited recline and the proximity to the lavatories may be bothersome. 22 C None No Power Seat 22 C is a standard Economy Class seat with limited recline and the proximity to the lavatories may be bothersome. 22 G None No Power Seat 22 G is a standard Economy Class seat with limited recline and the proximity to the lavatories may be bothersome. 22 J None No Power Seat 22 J is a standard Economy Class seat with limited recline and the proximity to the lavatories may be bothersome. 22 K None No Power Seat 22 K is a standard Economy Class seat with limited recline and the proximity to the lavatories may be bothersome. 24 A None No Power Seat 24 A is a standard Economy Class seat that is missing a window, but has extra legroom due to the Exit Row. The proximity to the lavatories may be bothersome. 24 B None No Power Seat 24 B is a standard Economy Class seat with extra legroom due to the Exit Row, however, the proximity to the lavatories may be bothersome. 24 C None No Power Seat 24 C is a standard Economy Class seat with extra legroom due to the Exit Row, however, the proximity to the lavatories may be bothersome. 24 G None No Power Seat 24 G is a standard Economy Class seat with extra legroom due to the Exit Row, however, the proximity to the lavatories may be bothersome. 24 J None No Power Seat 24 J is a standard Economy Class seat with extra legroom due to the Exit Row, however, the proximity to the lavatories may be bothersome. 24 K None No Power Seat 24 K is a standard Economy Class seat that is missing a window, but has extra legroom due to the Exit Row. The proximity to the lavatories may be bothersome. 31 K None No Power Seat 31 K is a standard Economy Class seat that is missing a window. 33 A None No Power Seat 33 A is a standard Economy Class seat in the last row of the aircraft that may have limited recline. The proximity to the lavatories and galleys may be bothersome. 33 B None No Power Seat 33 B is a standard Economy Class seat in the last row of the aircraft that may have limited recline. The proximity to the lavatories and galleys may be bothersome. 33 C None No Power Seat 33 C is a standard Economy Class seat in the last row of the aircraft that may have limited recline. The proximity to the lavatories and galleys may be bothersome. 33 G None No Power Seat 33 G is a standard Economy Class seat in the last row of the aircraft that may have limited recline. The proximity to the lavatories and galleys may be bothersome. 33 J None No Power Seat 33 J is a standard Economy Class seat in the last row of the aircraft that may have limited recline. The proximity to the lavatories and galleys may be bothersome. 33 K None No Power Seat 33 K is a standard Economy Class seat in the last row of the aircraft that may have limited recline. The proximity to the lavatories and galleys may be bothersome. 34 D None No Power Seat 34 D is a standard Economy Class seat whose proximity to the lavatories and galleys may be bothersome. 34 F None No Power Seat 34 F is a standard Economy Class seat whose proximity to the lavatories and galleys may be bothersome. 35 D None No Power Seat 35 D is a standard Economy Class seat in the last row of the aircraft that may have limited recline. The proximity to the lavatories and galleys may be bothersome. 35 E None No Power Seat 35 E is a standard Economy Class seat in the last row of the aircraft that may have limited recline. The proximity to the lavatories and galleys may be bothersome. 35 F None No Power Seat 35 F is a standard Economy Class seat in the last row of the aircraft that may have limited recline. The proximity to the lavatories and galleys may be bothersome. 8 A None No Power Seat 8 A is a standard Economy Class seat with extra legroom. 8 B None No Power Seat 8 B is a standard Economy Class seat with extra legroom. 8 C None No Power Seat 8 C is a standard Economy Class seat with extra legroom. 8 D None No Power Seat 8 D is a standard Economy Class seat with extra legroom. 8 E None No Power Seat 8 E is a standard Economy Class seat with extra legroom. 8 F None No Power Seat 8 F is a standard Economy Class seat with extra legroom. 8 G None No Power Seat 8 G is a standard Economy Class seat with extra legroom. 8 J None No Power Seat 8 J is a standard Economy Class seat with extra legroom. 8 K None No Power Seat 8 K is a standard Economy Class seat with extra legroom. Avianca offers over 500 songs of audio via personal Audio Video On Demand (AVOD). Avianca offers TV shows and the latest new release movies via personal Audio Video On Demand (AVOD). Every Business seat and two of every three Economy seats are equipped with regular 110V AC power outlets. The Boeing 787 Dreamliner is a long-range, mid-size wide-body, twin-engine jet airliner developed by Boeing. With a greater efficiency during flights as well as advance wing designs, the Boeing 787 has lower fuel consumption and can achieve higher speeds. This aircraft is used on various long- and medium-haul routes. Avianca also provides a seat to seat chat system through their inflight entertainment system. Boeing 787 Business class LAX to Bogota departing 8:15PM. Don't expect a cocktail hour. One hour after takeoff the carts are rolled right out and you get dinner. A thimble of wine, only refreshed if you flag someone down. Nothing remarkable about the food which I suspect might have been flown up from Bogota. Flew Bogota to Madrid. Modern plane, IFE system was pretty good, if a bit laggy. Lots of films and music available. The food portions were a bit stingy though. The wine was nice. The toilets noted between rows 22 and 23 are incorrect. There are just 2 toilets in the centre of the plane. The other toilets do not exist. There were therefore up to 6 people waiting for each toilet at certain times with people hopping between lanes. Row 23 severely inconvenienced by this. Service was very good on our Bog-LHR flight. The galley is quite close, so you will hear noise from it. But since this flight departs late at night you will be able to sleep properly in the flat bed. The complimentary comfort kit is Tumi and it has everything you need. The seat is quite private and you can barely notice the person to your side when being in full flat position. They also give you a pack of colombian coffee before arriving at London. I love this reverse herringbone seat layout! The seats are very private. My seat was comfortable, and just the right distance from the flight attendants talking in the galley. The windows don't have shades. There is a button you press and the tint becomes darker or lighter. The 2 windows are large. Comforter and pillow are good, and the comfort kit was Tumi. Service was, eh, but I didn't have any jetlag due to the lower cabin pressure on the 787. The entertainment choices were OK, not great. 4 lavatories in economy. No crossover aisles for stretching legs you can only walk in one aisle. Back galley closed off. Open areas in diagram do not really exist. Row 8 does have more legroom but those are reserved for Lifemiles elite and nonrevs. This plane has an excellente Bussines classwhere you can have your own space independat from other seats. This row has a little beat less space than the ones in the back rows in business class. Last row between bussines and economy, a lot of babies on that area, noise. 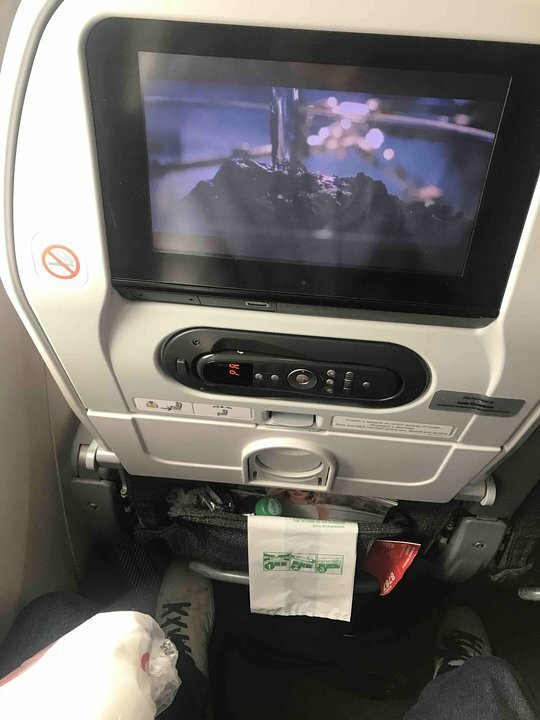 The business seats in the first row have definitely less spase for the legs. You might not notice if you are not tall but for me (1.96m) i wasn't able to strech out at all. I was glad the flight wasn't booked out, so i could move in one of the back rows. Avianca flies 1 versions of Boeing 787-8.